IGC provides independent lab services for jewelers and jewelry stores, while maintaining the highest level of quality and staff. Diamond Certificates - ​The certificates include information about the four C's, the measurements and proportions of the diamond. This certificate comes in different sizes; full size, small size and card size. Diamond Appraisals - available for diamonds and gemstones both mounted and loose. The appraisals include an estimation of the retail value of the stone. Diamond Certificates + Appraisals - ​ ​The certificate include information about the four C's, the measurements and proportions of the diamond and includes an estimation of the retail value of the stone. 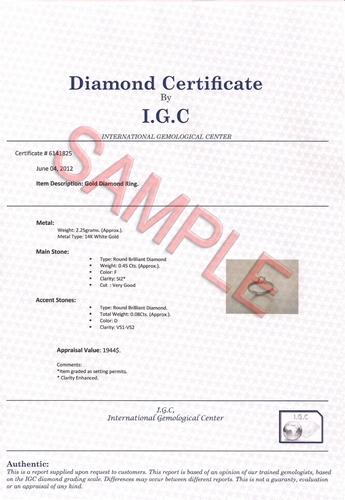 Fancy Diamonds Certificates - ​The certificate describes the diamond color in terms of hue, tone and saturation. Hue refers to the diamond's characteristic color, tone refers to the color's relative lightness or darkness and saturation refers the color's depth or strength. Online verification - Once the stone is evaluated and the certificate is created, a scanned copy is published online. You can verify your certificate authenticity using this service.